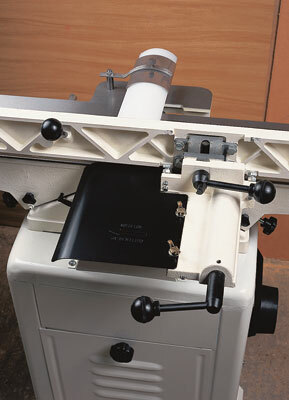 The CT 150 jointer/surfacer comes largely assembled - the main part being the cast iron beds which are extremely heavy to lift out of the box and onto a flat surface for preparation, so you do need help. The deeply ribbed castings are covered with a varnish-like gunk, which white spirit easily removes revealing beautifully milled beds. 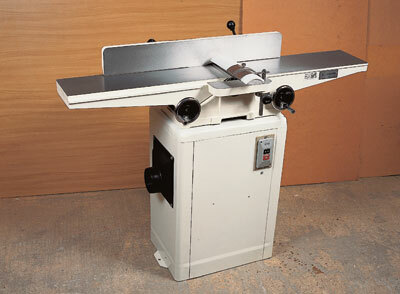 At 1180mm (46 1/2in) long by 150mm (6in) wide, this is a substantial machine. The beds are raised and lowered by two old fashioned handwheels - the lowest position blade-changing can be carried out on the well-balanced three-knife block, using the handy setting jig. The front bed is also lowered for rebating up to 13mm (1/2in) deep. It has a metric depth scale and pointer which were set correctly when it arrived. The long cast fence has to be attached via a rod and lock lever underneath which fit a slot in the fence support. A precision keyway ensures the fence runs precisely. The fence can be angled for bevel cuts thanks to a cast alloy knuckle joint that has adjustable end-of-travel stops for 90 degrees and 45 degrees. A piece of pressed steel fits over the exposed blade behind the fence, whilst the bridge guard is a tough nylon-type material which is easily adjusted for height on its post, and can be moved sideways too. The pressed steel cabinet it sits on has had no time or money wasted on it, but it does the job. 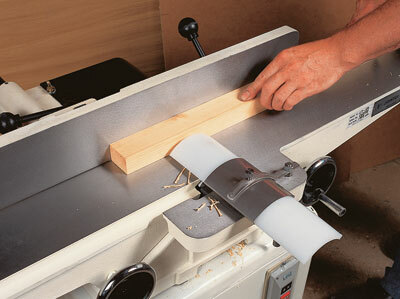 The jointer sits on top, then is bolted down, and alignment between the upper and lower pulleys checked. The V-belt can be eased onto the top pulley by rotating it by hand, with the power off, until the belt pops in, although the motor in the cabinet can have its mountings loosened if necessary. A two-button NVR switch operates the machine. The CT 150 performed as well as it looked - beautifully! This is probably the quietest machine of this type I have ever used. Start-up is unflustered, although the cut does sound rather as though the knives are tearing at the wood, but the actual finish is very good. Switching off does create a bit of noise as the motor begins to act as a brake and the block is still trying to spin, thus putting the V-belt under a bit of strain, but it is nothing untoward. 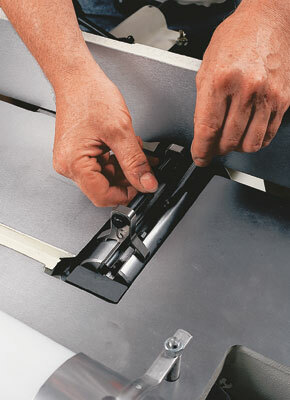 The pressed steel blade cover bounces a bit in use which is not a problem, but a bit of stiffening would help. The ejection of chippings works well and a large diameter spout can be fitted for proper extraction. The fence has a slight bow in it, which is not unusual - manufacturers have trouble with long castings staying flat after milling. But it didn't affect accuracy as it merely pushes the work slightly away from the fence. As always, fence settings need to be checked for true with an engineer's square before starting work. Bearing in mind the relatively inexpensive cost and the space it saves in the workshop, this is an excellent piece of kit that should give years of service. "The CT 150 performed as well as it looked - beautifully!"